Tara is the Great Goddess in Celtic lore, where her name is the root of *Tor*, a hillock of earth with a spiritual connection to other planes. The name “Tara” is also connected to “Terra”, our Mother Earth. However, the origins of the Tara most known today are in Hinduism, where she was seen as a manifestation of both Kali and Parvati. Her name means *star* and she was thought to have been a Boddhisattava, and a Goddess of Mystery and Mysticism. 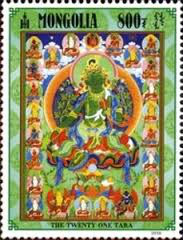 Tara was adopted into Buddhism and became one of the most popular Goddesses in their pantheon. To them, her name comes from the root “tri”, which means “to cross”, which is why she is also the one who “ferries her people from delusion to knowledge”. She has compassion for all living beings, desiring to save them from suffering, which connects her to the Boddhisattava/Goddess Kwan Yin, who also hears the cries of those who suffer and offers them mercy and compassion. There are two main origin stories for Tara. One is that she was a spiritual and compassionate princess who prayed and gave offerings to the local monks and nuns. When one of the monks said that he would pray for her to be reborn as a man, she replied that there was no male/no female/no reality. She would stay in her female body to help others reach enlightenment. I adore the feminism in her ancient statement, which is still relevant now. The other origin story, which explains the existence of two Taras, is that She/They were born from the tears of Avalokiteshvara, the Buddha of Compassion. As he was crying from seeing the suffering in the world and of his people, two giant tears fell from his eyes, resulting in the birth of the peaceful White Tara and the ferocious Green Tara. While they call Green Tara ferocious, She is mainly playful and full of mischief, always ready for call to action and activity. This is evidenced in Her posture upon Her lotus; Her right leg is extended ready to jump up, while her left leg is folded upon the lotus itself. Green Tara symbolizes the night and holds a blue lotus in her left hand for purity and power; she is covered in bracelets, necklaces and jewels. With her right hand, she grants wishes and overcomes fears. 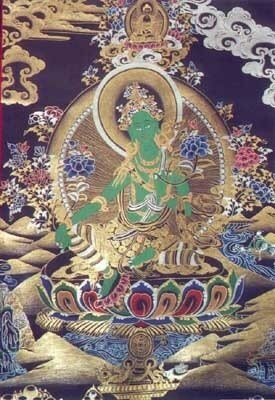 While Green Tara is mostly seen as a young woman, White Tara is seen as a mature, full breasted woman. 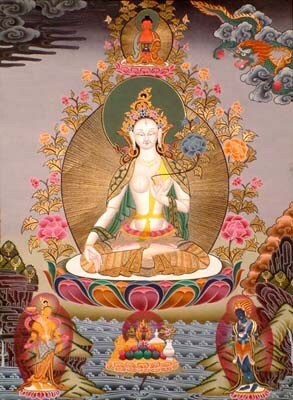 She is the Mother of All Buddhas and symbolizes day. She has seven eyes – – the two usual, one in the Ajna (third eye) chakra, one on each hand and foot – – to more closely see the suffering in the world. 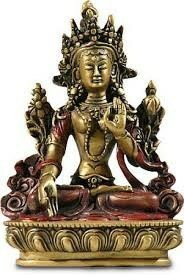 In her left hand, in the mudra (hand yoga) of protection, she holds a white lotus for complete truth and purity. 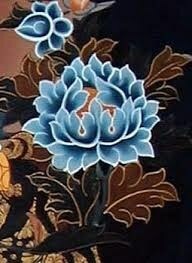 This lotus has three blooms. The first bloom, with seeds, represents the Past; the second bloom in full flower, represents the Present, and the third, which is ready to blossom, represents the unknown Future. She is the essence of all three. 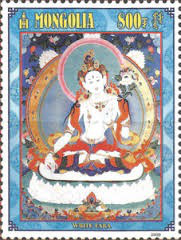 Tara is also known as *She Who Brings Forth Life*, *The Great Compassionate Mother”, “Embodiment of Wisdom”, and The Great Protectress”. May the Goddess, by whatever name you call her, bless you and keep you safe.